Whatever political system one believes in, most of us just want our leaders to be honest and put the interests of their people ahead of personal gain. Whether fairly or not, many believe this to be the exception rather than the rule in politics. Perhaps that's why there are so many variations on the idea of a commoner and a ruler, identical in appearance, switching places. The commoner of course has difficulty learning how to work within the system at first, but once they get the hang of it, they end up doing a better job than the “real” ruler. This notions goes back at least to Mark Twain's 1881 novel The Prince and the Pauper, and has more recently served as the basic plot for Akira Kurosawa's 1980 film KAGEMUSHA and its unofficial American remake DAVE from 1993. 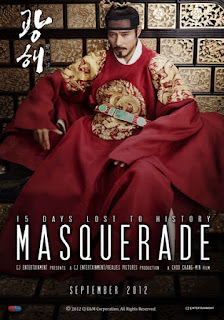 It's also the central theme in MASQUERADE, a Korean film that tries to fit this political fantasy into actual history, positing that the King Gwanghae made just such a switcheroo with a lowly entertainer named Ha-Sun (both played by Lee Byung-hun) after being drugged by his enemies. The plot proceeds form there more or less as we'd expect it to, with a fair number of twists and turns and double crosses along the way as Ha-Sun learns the ropes of royal life and ultimately begins to act like a real king, only with more compassion and common sense. Of course the deception can't last, and even survival is far from certain for both Ha-Sun and Gwanghae. So no, not many points for originality. That said, MASQUERADE makes this familiar material feel, if not exactly fresh, at least interesting. 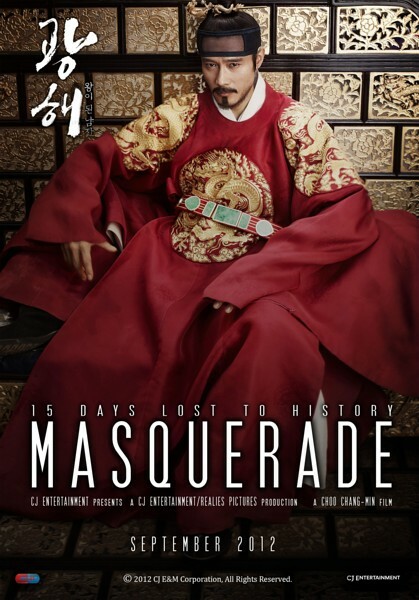 The performances are first rate, there's a nice blend of humor and action, the sets and costumes are sumptuous, and while director Choo Chang-min isn't exactly flashy, he has a solid grasp on filmmaking technique and storytelling. In short, it's a good looking, solidly made entertainment that plays to a universal strain of fantasy wish fulfillment. 3 out of 4 stars.